Among the mysteries of the sea, Stromhaven stands proud and defiant, a city built upon the relic of an unknown civilization. Four great pillars support a disk of preternatural stone, its architects an enigma as great as the means of its construction. The new inhabitants settled centuries ago, giving the city its current name because of the solidity and endurance it offers against the surrounding ocean is undeniable. Settlers erected their own dwellings on top of the disk and, when they crowded it too much, engineered a floating city lashed to the four pillars. Magic is the life blood of Stormhaven, coursing through its very foundations and making life comfortable away from the shores of any nation. Its staunch neutrality ensures that the riches keep flowing, making Stormhaven into a monument to unfettered greed and hunger for power. It is the destination of choice for the most ruthless merchants, crime lords and politicians, where a silver tongue, quick wit and a fast blade are invaluable commodities, both on the lowly docks and the glittering palaces. Any adventurer with the right combination of ingenuity, strength and daring will find that Stormhaven embraces him like a lover and that no dream of wealth, no matter how extravagant, is beyond his grasp. 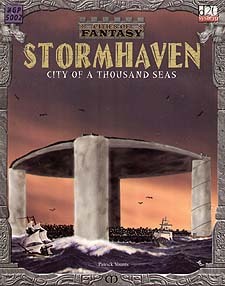 Stormhaven - An Overview: Stormhaven is a free-floating, artificial island of white stone held three hundred feet above the sea by four great pillars, each a quarter mile in circumference and covered with ancient runes. Discover its history, government and laws. Upside: The pinnacle of Stormhaven, the wealthiest residents live on a platform suspended high above the ocean, far beyond the concerns of the wretched beneath. Driftdowns: Some would say this is the true city of Stormhaven. Under the constant shadow of the mighty disk above, almost anything can be found in the Driftdowns - for a price. Sailors, Soldiers and Scoundrels: Many illustrious personages make Stormhaven their own. Learn about the movers and shakers of this great and majestic city. Sailors' Tales: Few truly believe tha tales of sailors who have journeyed from Stormhaven but for the adventurer, they prove almost irresistible. Legends and rumour are rife in the City of a Thousand Seas, and all manner of strange charcters make it their home, in possession of highly exotic spells, magical items and feats.